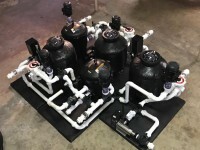 Probably half or more of all systems shipped out by GC Tek are customized systems. We take into consideration Your pond size, Your fish load, Your Lifestyle, and last but not least, Your budget. We then help you decide what system is right for you. Just give us a call. We want to help.